British-Iranian drama film written and directed by Tina Gharavi. The film was nominated at the 66th British Academy Film Awards for Outstanding Debut by a British Writer, Director or Producer. The film touches on aspects of racism and treatment of refugees in the UK. We'll also be doing a Q&A session with special guest Shiraz Haq, who is starring on the film. 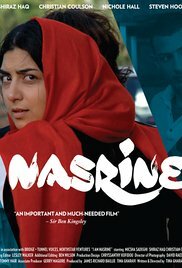 "I Am Nasrine follows the paths of Nasrine and Ali, sister and brother in a comfortable, middle-class Iranian home. When Nasrine has a run-in with the police, the punishment is more than she bargained for: their father orders them both to relocate to the UK. Screening on April 6th 2016, Wednesday, followed by a special Q&A session with special guest Shiraz Haq, who is starring on the film.